With the rise in the popularity of crime dramas like CSI, more and more students are choosing to study criminal and forensic science in the United States. If you are an international student considering this area of study, be warned that criminal and forensic science, though rewarding, is not nearly as glamorous as it appears on TV. You need to be prepared for a lot of hard, and sometimes tedious, work. Criminal and forensic science majors will study both science and criminal justice. In this major, you will learn how to reconstruct crimes and analyze physical evidence such as blood, DNA, fingerprints, and other evidence and how to use it in a court of law. You will also learn how to use many laboratory tools to collect and test data. Forensic science programs will teach you how to “listen to the dead.” Both crime scenes and crime victims can provide you with clues as to what happened, how it happened, when it happened, and most importantly: who did it. You will learn how to examine trace details such as skin, hair, and clothing fibers, as well as DNA, blood, and fingerprints and, in the case of a murder investigation, wounds, patterns of blood loss, and the amount of decay. You will learn how to analyze all of these in order to reconstruct an accurate scenario and determine who did the crime. However, bear in mind that forensic science is not just about murder investigations; the skills you learn will also help you determine whether a crime was committed in the first place. First and foremost, criminal and forensic scientists are just that: scientists. This means that you should expect to take as many science-related courses as a premed student. You will take several chemistry courses, including general chemistry, organic chemistry, and biochemistry. You should also expect to take biology, physics, genetics, and anatomy courses. You will also study methods of investigation and how to analyze different types of evidence. This can include collecting, transporting, and storing evidence, as well as instruction in how to use microscopes and other tools. In fact, many criminal and forensic science programs will require you to take archeology courses that teach research methods used on digs. About 50 four-year colleges and universities in the United States offer bachelor’s degrees in criminal and forensic science. Many of these schools also offer graduate degree programs. Typically, an undergraduate degree in criminal and forensic science can be completed in about four years, but there are several community colleges that offer two-year programs in the technical aspects of forensic science (such as lab analysis). These can be transferred to a four-year college or university. 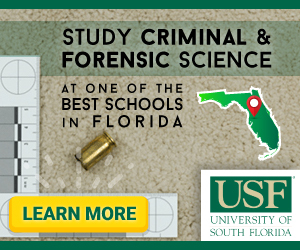 Graduate degree programs in criminal and forensic science take anywhere from two to five years to complete after you have finished your bachelor’s degree. Criminal and forensic science is a fascinating area of study that can lead to a highly rewarding career. If both science and criminal justice intrigue you, then this might be the field for you.